Hello folks! 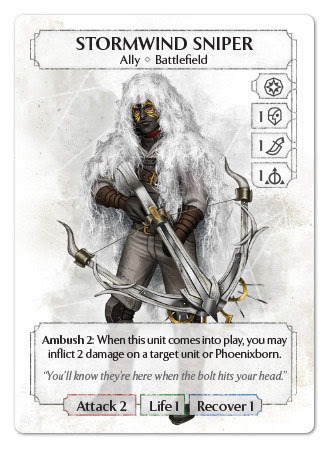 Here we are again with another installment of my series of review of the Ashes preconstructed decks. 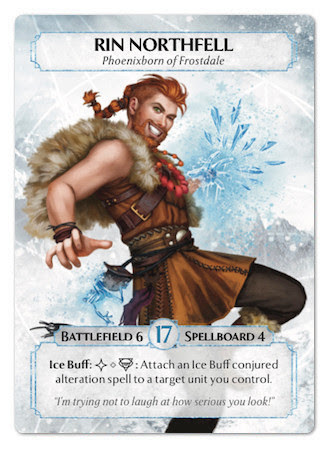 With the analysis of the Cloudsea Siren, we finally covered all the Base Set decks, and can begin talking about expansions, beginning with Rin Northfell and his Frostdale Giants deck. Battlefield 6, Spellboard 4 and a Life value of 17 make Rin a discrete Phoenixborn, with neither big perks nor flaws, at least stats-wise. 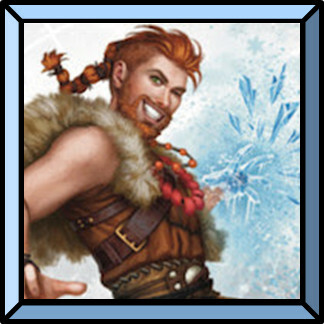 His special ability, Ice Buff, is peculiar, as it can be activated without spending any dice, and allows Rin to increase the Life Value of one of his units by 1 with a simple Side Action, through the Ice Buff conjured alteration spell. 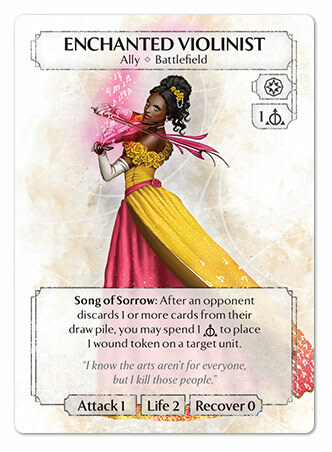 It might not seem much, but in the overall economy of the game, it’s a dice you saved to do something else, and it allows you to more easily play some units, like the Rose Fire Dancer for instance, that are economically disadvantageous due to their cost being higher than their Life value. Alter such units with spells to make them even tougher and more powerful. On the other hand, don’t expect many elaborate tricks from Rin: befitting to Nature Magic’s innate lack of subtlety, this deck is elegant as a sledgehammer, but that doesn’t mean it can’t get its job done well! 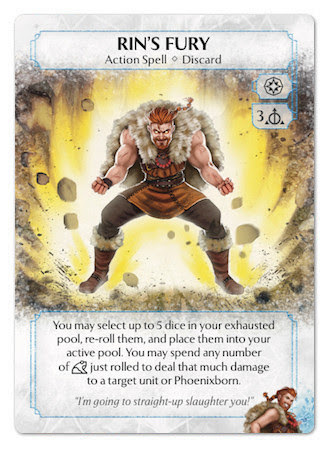 If Rin’s ability allows us to essentially gain a slight dice advantage over the opponent, his unique card, Rin’s Fury is yet another step towards economic efficiency: by spending 3 basic dice, this Action Spell makes you recover 4 dice from your exhausted pool (including any or all dice you spent to cast it – remember all the costs of an effect, including exhausting the dice, have to be completely paid before resolving that effect). What you lose in control and/or consistency against other dice recovery cards, like Hidden Power, Illusionary Cycle, or Expand Energy, you gain back in net dice efficiency, and the advantage you can get by playing 12 dice in a single round is undeniable. 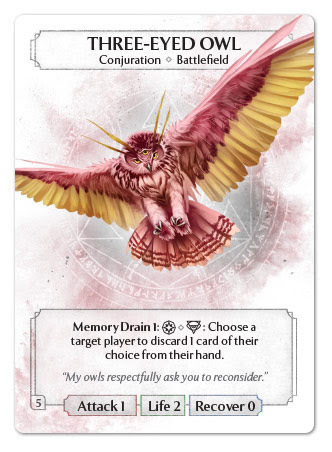 Icing on the cake, you can also decide to spend any number of natural power symbols you just rolled to deal as many damage to a single target unit or Phoenixborn. This is definitely an interesting option, and rolling some frogs and dealing some direct damage to the opponent is satisfactory, but in the end, this is – IMHO, an useful “extra”: 99% of the time you would use Rin’s Fury to push on dice advantage. Also remember that, because of the effect resolution procedure, you need to (and are forced to) choose the target of the damaging effect before rolling the dice, then you are free to choose how many power symbols convert to damage, but the target must be chosen “blindly”. 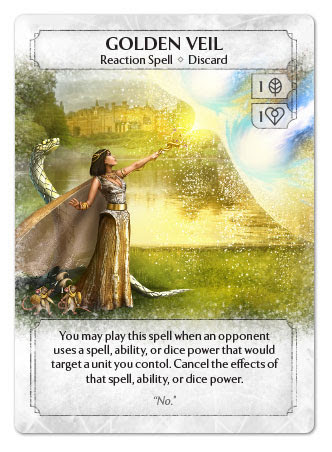 Moreover, if the opponent uses a card such as Golden Veil or Vanish to cancel the effect, all the effects of the card – but not the costs – are cancelled, thus you spent 3 dice for nothing. For this reason, if you want to be sure Rin’s Fury goes off, you’d better choose your own Phoenixborn or a creature you control as a target. 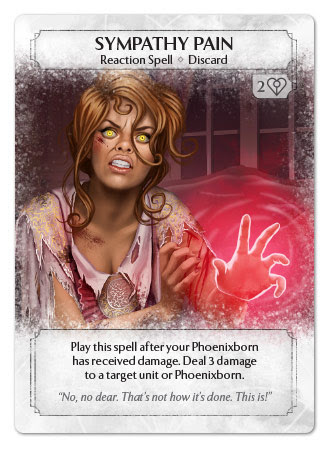 Rin’s spellboard provides us with beefy conjurations through which we can obtain battlefield supremacy, and a way to deal direct damage to the opponent’s Phoenixborn. 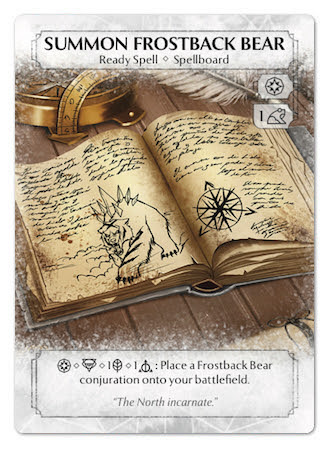 Rin’s deck comes with one of the most solid conjurations in the game, at least up to now: Summon Frostback Bear. 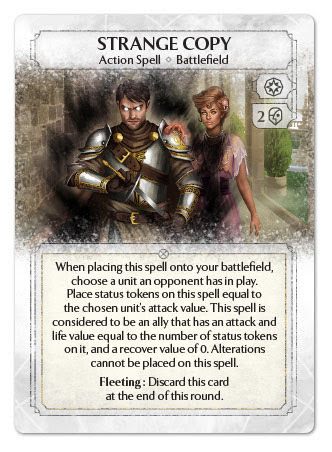 It has a moderately heavy “casting tax” as it costs a Nature Power Die just to place on the board, making the first Frostback Bear you place on your battlefield cost 3 dice, but then, for a Nature and a basic dice, you can have a 2 attack / 3 life unit on the board. You want more? You can have up to 4 of those at the same time! More? They come with abilities too!! Still not enough for you? 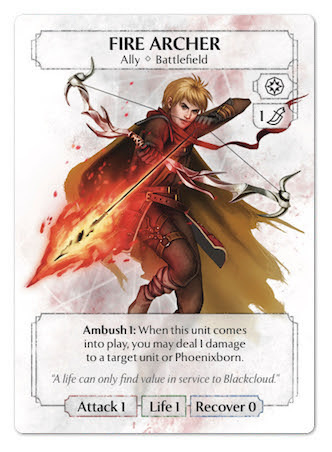 Well… both abilities are awesome: either the Bear is becomes, the equivalent of a 3 attack unit when attacking a Phoenixborn, or it can, by spending a mere basic die, render an opponent’s unit it is in battle with but it is unable to kill useless for one. 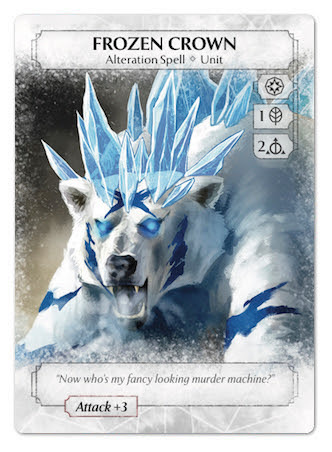 Please note that due to how timing of attacks (currently) works, the Frostback Bear deals its damage, and is able to trigger its Freeze ability, before the damage and destruction resolution process starts, and thus before effects that trigger on receiving damage can be used. By that time, if the Bear used Freeze, the unit it is in battle with would be exhausted, and would not be able to trigger abilities such as Pain Link or Shadow Drain. 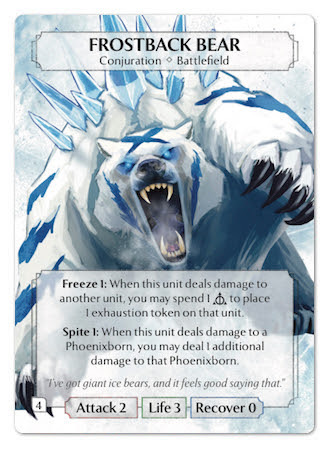 The second of Rin’s conjured units, the Ice Golem is only in appearance more fragile than the Frostback Bear. 3 Attack and most importantly 2 Life can seem too few for a unit costing 3-dice, of which 2 class. The Skin Morph ability can fortunately compensate for its main disadvantage, granting it 2 extra Life as long as it has an alteration spell attached. 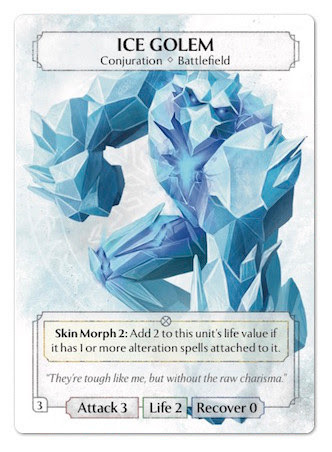 Just a little alteration and immediately the vulnerable Ice Golem becomes a solid presence on your battlefield, with 3 Attack and 4 Life. Sure, it’s pricy, and subject to effects like Ice Trap and Dispel, but if you manage to keep it altered, you’ll have a pretty beefy unit in play. The synergy the Golem has with Rin’s Ice Buff is blatant, making it a 3/5 with no really big effort on your part. The Focus 2 effect of Summon Ice Golem is rather useful, though I don’t think you’d need to rush and get it. I consider it one of those abilities that if are available, the better, but don’t make the difference if not present. 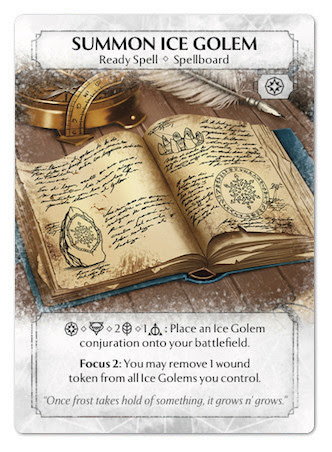 Regarding that, I remind you that if you can’t put a Golem into play (either because your Battlefield is full, or because all 3 Ice Golems are in play), you still have the chance to activate the ready spell – appropriately focused – to exploit its Focus 2 effect, since abilities and effects you can’t fully resolve will be resolved as much as possible. The third and final Ready Spell Rin can play (note that, as it happens with Jessa, Rin’s preconstructed deck doesn’t use up all his Spellboard Slot), is Frost Bite, a spell costing a Main Action that allows you to convert a Main action and a Nature die (or a basic, if focused) in a damage on any target, unit or Phoenixborn. This spell allows you to slowly drain your opponent’s Life without too much of an effort, or to remove, with the help of the Nature Die Power, enemy units from the board and allow your Bears and Golems to attack. In both cases, it can exploit well the synergy with the big units Rin can put into play. 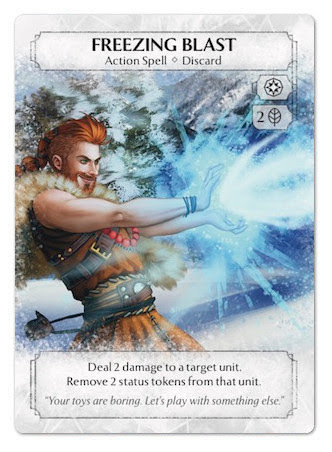 The activation cost of a Main Action is not as bad as it could seem at first, as usually with the Nature Die only (assuming you have power die available) you can only deal 1 damage per turn to enemy units, while with Frost Bite you can, if needed, concentrate 2 damage in a single turn. 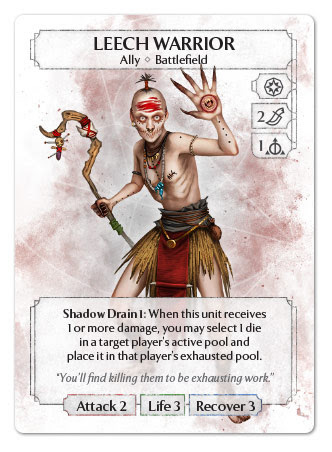 Another tactical advantage granted by this spell lies with the fact that, often, as rounds go on, you could find yourself unable to spend all your dice in your active pool. In this situation, having a card that allows you to reduce the number of unspent dice greatly increases your efficiency. 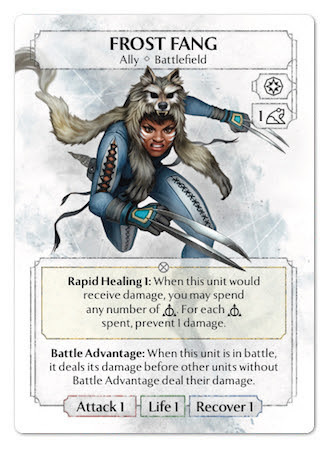 Rin’s one and only ally, Frost Fang is a cheap and deceptively weak support unit. It may not be powerful as the conjurations in the deck, but Frost Fang is still a tougher unit than it might seem at first sight. 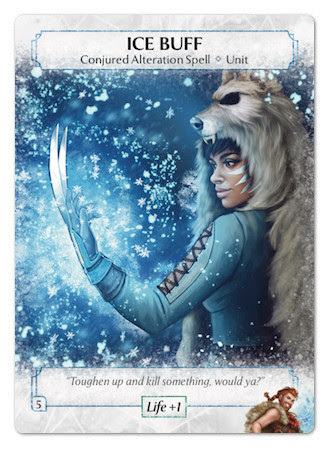 Thanks to Battle Advantage, this 1/1 ally can destroy – supported by the Nature die power or by cards such as Frost Bite or Freezing Blast – much stronger units and survive. 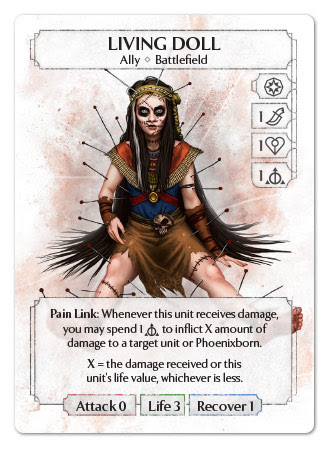 Her Rapid Healing ability allows her, as long as you have dice at your disposal, to counter your opponent’s direct damage effects, and to keep her alive when Battle Advantage is not enough. 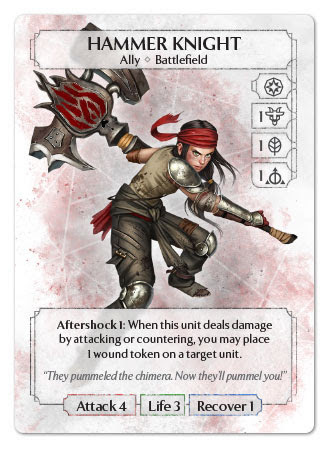 The big issue with this card lies with the fact that, in order to keep it in play, you’ll probably need to spend a lot of dice, something that’s probably not much worthwhile for a 1-attack unit, so be careful on how much resources you want to invest, lest you find yourself short of dice. Also remember that Frost Fang is extremely vulnerable to effects that directly place wounds, and therefore can’t be prevented: while maybe Molten Gold might be overkill, units like Enchanted Violinist, Hammer Knight or Crimson Bomber can blow her away with ease. 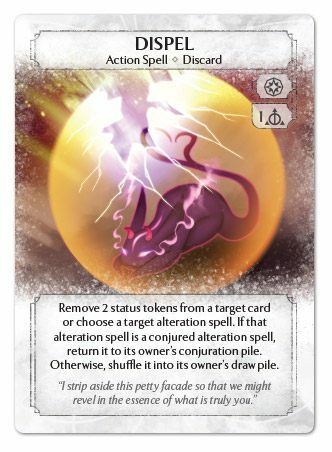 What can an Action Spell in a mono-Nature deck do other than dealing damage to the opponent’s units? Dealing direct damage is one of the things Nature Magic can do better. 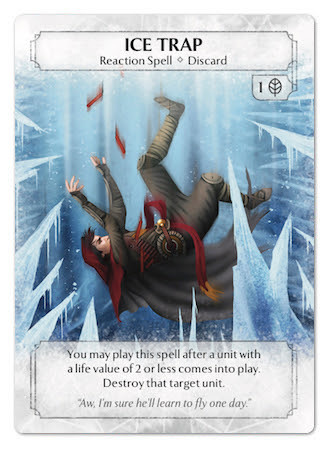 As Frost Bite and Rin’s Fury don’t seem to be enough to supplement the die power, here’s Freezing Blast, an Action Spell costing 2 Nature dice and a Main Action, which allows you to deal 2 damage on a unit and, if there are any, remove 2 status tokens from it. 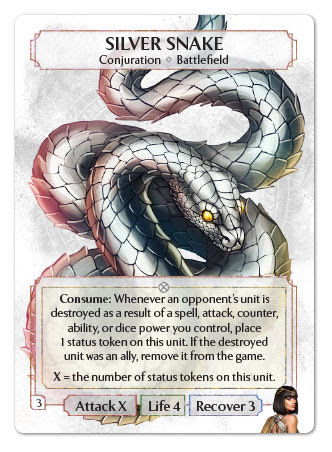 Let’s leave aside this secondary effect that, while useful against some units, it’s extremely situational (at the present time it’s devastating against Strange Copy, and can sensibly slow down the growth of Maeoni’s Silver Snakes, but hasn’t many more uses) and focus on the damaging effect. Theoretically, this card is useful, as it allows you to replicate the dice power by spending class dice, and to add up multiple direct damage on a single action (many direct damage effects only deal 1 damage). Its main cost can be seen as a disadvantage, as it doesn’t allow you to exploit the breach you could create in the opponent’s defences and attack in the same turn, but from another perspective it’s convenient, as it leaves you with a Side Action free to deal another damage with a power die. 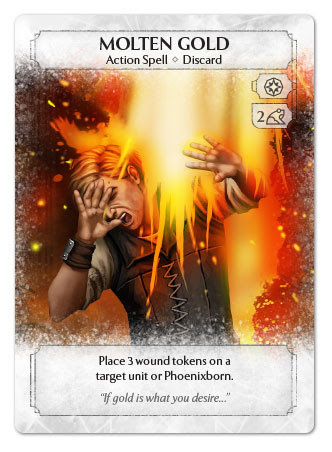 In general, while not being theoretically a bad card , it struggles to find place outside the preconstructed deck at the moment as there are much more flexible and/or advantageous alternatives, like Molten Gold or Sympathy Pain that can hurt the opponent more and hit a broader variety of targets, and Ice Trap that, while limited to small units, has a lower cost and makes you gain one turn. More ways to deal with enemy units? Why not? And since we mentioned it, let’s talk about the only Reaction Spell in Rin’s deck. Ice Trap costs 1 nature die and allows you to destroy a unit with life 2 or less after it entered play. From a merely numerical point of view, this card is extremely advantageous. It’s basically the same of 1 die for 2 damage, and it ignores any prevention effects since it destroys its target directly. Being a Reaction Spell allows you to gain a tempo advantage, as it negates the opponent’s action and basically lets you take 2 consecutive turns. It obviously has its rather evident limitations: it’s ineffective against the most resilient units, and it has no utility whatsoever against anything that’s already in play when you draw it. 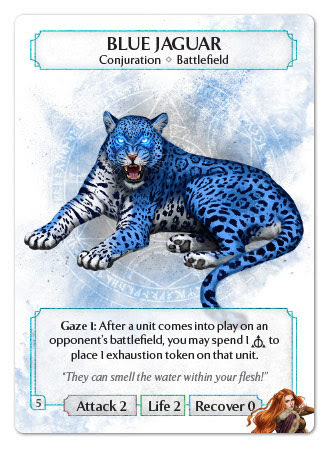 This said, it’s strong against a wide array of units, especially in the First Five, to deal with those pesky Three-Eyed Owls, Blue Jaguars, Glow Finches and such. 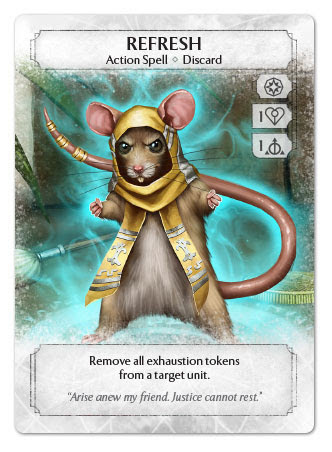 A note about timing: since Ice Trap triggers “after” a unit has entered play, it can’t prevent units with effects that trigger “when” they enter play (such as the Stormind Sniper or Fire Archer‘s Ambush) to resolve their abilities. Rin’s Alteration Spells offer more ways to secure the battlefield, either by empowering your own units or by limiting the effectiveness of your opponent’s ones. Nature magic provides various effects to make your units stronger and tougher, mostly through Alteration Spells, and Rin’s deck offers a couple of interesting options on that front. 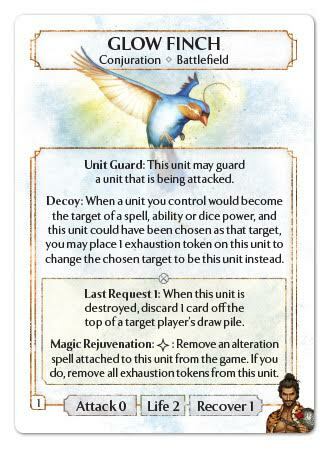 The first is Crystal Shield, an alteration costing 1 Nature and 1 basic dice, that increase the life value of the altered unit by 2 and gives it Unit Guard. 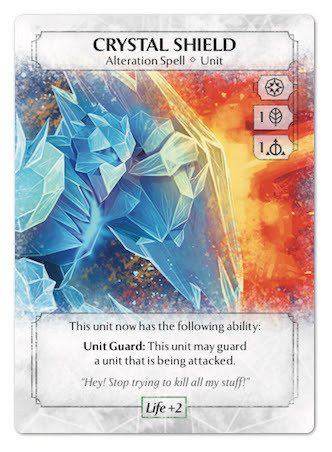 Rather useful if you want a stern defender for your main fighting units (on an Ice Golem the latter becomes a 3/6 with Unit Guard, not bad at all…), it unfortunately lacks a Respark cost, though, so once discarded it’s virtually impossible to recover. Overal it’s a pretty good card, despite alteration spells that are useful on your units sill struggle to find their place in the game. Rin’s second “helpful” alteration spell is Ice Crown. This card grants a unit a juicy +3 bonus to its attack value. Too bad it costs 3 dice and it’s extremely taxing to play. True, Rin has ways to mitigate its cost through its unique card, and Ice Buff can provide for the lack of defensive bonus from Ice Crown. Still I feel it costs a bit too much for the benefit it brings, compared to the risks involved: as long as you manage to play it at the right time and exploit it to deal 3 extra damage to the opponent’s Phoenixborn, then it would be probably worth the cost, but you should be careful, as the altered unit will immediately become a priority target for your opponent. In contrast with the two previous cards, the purpose of the third and final of Rin’s Alteration Spells is to mess with the opponent’s plans. 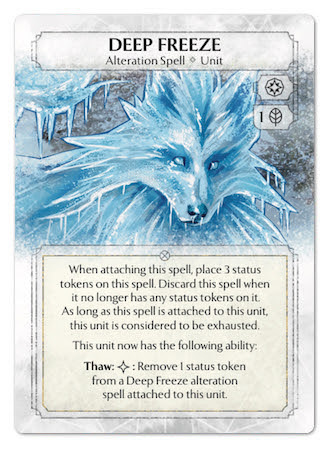 Costing a single Nature Die, Deep Freeze makes the unit it is attached to considered to be exhausted. 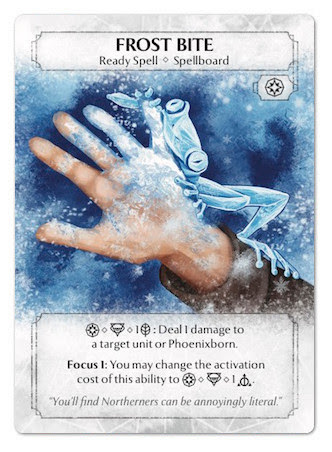 With such a low cost there must definitely be a catch, and indeed Deep Freeze is not permanent: it enters play with 3 Status tokens, which can be removed by the attached unit’s controller by spending a Side Action each, and when it’s free from tokens it’s discarded from play. Being a temporary effect makes it, in my opinion, quite underestimated, as it is seen not as an instrument to deal with problems, but just to delay them. I think however it is a rather interesting card: its cost is so low, and it ignores many cards that in the majority of situations can negate exhaustion effects: it can’t be cancelled by Golden Veil and cards like Refresh or Change Psyche can’t affect it in any way. 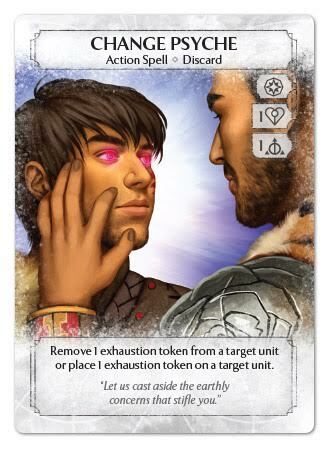 In most cases the opponent will need to spend three turns to remove it, three turns in which they can’t meditate, use dice powers, nor use a good chunk of spells and/or effects. This will allow you to have a “safe” window to plan your future moves. And should they ignore it and not spend any side action to remove status token, the better: there will be an occupied slot in their battlefield for a longer period. And, as always, before saying goodbye, here’s in short what I think are the strong and weak points of this deck. Poor ability to react to the opponent’s moves outside unit removal. Poor strategic flexibility, both due to cards belonging to a single magic type, and because Nature Magic doesn’t lend itself to elaborate tactics. And with that, I thank you and say goodbye, at least for now. As always, if you have any question, doubts or comments don’t hesitate to write me. 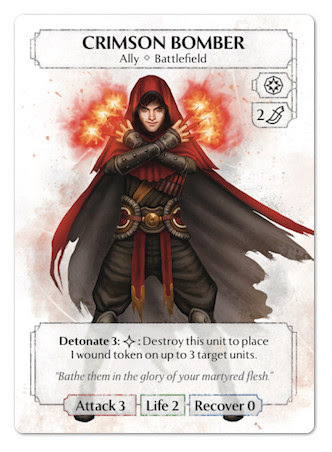 Next time we’ll talk about Brennen Blackcloud‘s mono-Ceremonial deck: the Children of Blackcloud. Your reviews are really good. Very complete! I like the explanation of the little tricky things ! I learned a lot of subtleties about the rules thanks to you. I wait for the others reviews with great impatience. Keep on going ! very good work ! Great series of posts, will you be taking this up again with the new expansions?